Immediate past Chief of Army Staff (COAS), Lt Gen Luka Nyeh Yussuf is dead. The former COAS died in a London hospital Tuesday morning after a brief illness. Born on September 22, 1952, he hailed from Bara Kagoma, Jama'a Local Government Area of Kaduna State. The late Gen Yusuf was commissioned into the Nigerian Army Artillery Corps in 1975 and was a member of the Nigerian Defence Academy (NDA) Course 14. He was a Nigerian Contingent (NIGCOM) Commander under the UNAMSIL before being appointed the Chief of Staff of the Liberian Armed Forces. Late Gen Yusuf was appointed the COAS in May 2007, a positioned he held till August 25, 2008. Already, a condolence register has been opened for sympathisers at the Nigerian Army Headquarters Abuja. To drive home his point he said "we were 101 that got admission to NDA in 1973; only 67 came through two years later, today, 28th of August 2008, I am the last man standing among the 15th Regular Course. I am an extremely fulfilled man, among uncountable opportunities God put my ways, I am proud to have tasted battle and commanded the Nigerian Army, the pride of every soldier". He put in 12,898 days and approximately 307,896 working hour in the service of his fatherland. Yusuf was very particular about the welfare of his men, "Never in the history of the Army has barracks been renovated enblock as five barracks are slated for renovation, meaning that in four years, all Army barracks in the country would have been renovated. We also made sure that our troops on peace support operations get their full allowances as stipulated by the United Nations. It has never happened before". He also launched the Barracks Youth Foundation, for the upliftment of the teeming youngsters in the barracks to underscore the importance that idea. The transformation of the Army was also cherished by the deceased officer and he put so much energy into the realisation of that dream. 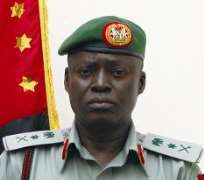 The Nigerian Army also announced the death of the Commander of the Nigerian Army Medical Corps, Maj Gen Innocent Shuaibu Ejeh. The late Gen Ejeh died on May 30, 2009, after a brief illness. Late Gen Ejeh, who was a Fellow of the Royal college of Obstetrics and Gynaecology, hailed from Ogbadibo Local Government of Benue State.